Wana Decrypt0r Trojan-Syria Editi0n Ransomware is yet another malicious program that you should be aware of and must avoid at all costs. As one more file-encrypting application, this one can lock huge chunks of data on the affected operating system in a matter of minutes. In fact, at times it could compromise files beyond repair. As you can imagine, having this malware fully functional on your PC could have disastrous outcomes. To understand where it comes from and what can you do to protect your personal computer from it, make sure to read the rest of this report as we present simple, yet extremely effective virtual security tips. Alongside such information, you will also find extensive information about the overall functionality of this ransomware program with its detailed removal guide that will help any user affected by this malware to get rid of it in just a few simple steps. 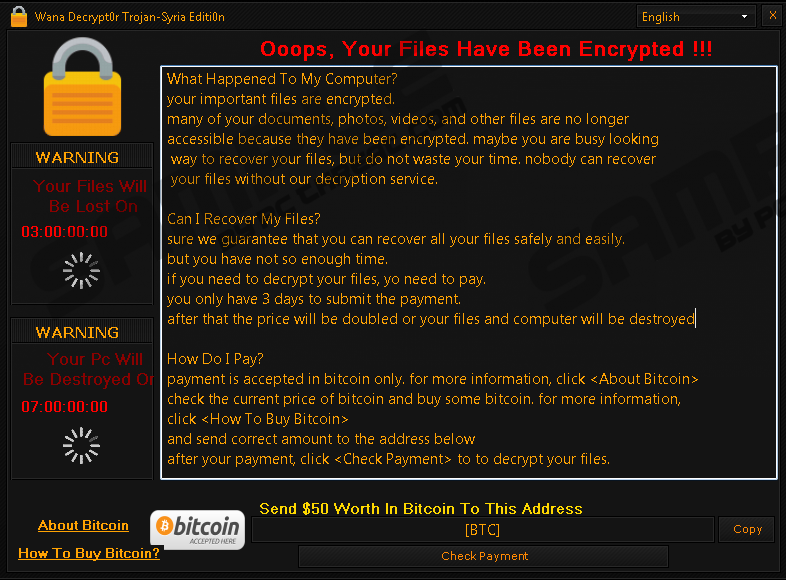 Wana Decrypt0r Trojan-Syria Editi0n Ransomware seems to be in its testing phase at the moment since our malware experts have discovered that this malicious application does not encrypt data on the affected computer. While this is good news for sure, the program in questions remains a major virtual threat, which could start working any moment. If this happens, it will quickly determine the contents of your hard drive and then will start an encryption procedure. During the researcher, our malware experts have discovered that this malicious program mostly target file types such as mp3, .mp4, .pdf, .php, .png, .ppt, .txt, .doc, .docx, .gif, .htm, and quite a few others. It is fair to assume that developers this ransomware would use an AES or RSA type cipher to lock data to eliminate any possibility of manual decryption. Even though nothing happens to your files once you launch the malicious executable, you will still see a warning message. It will falsely inform you that you no longer have access to your operating system. Also, it will ask a $50 ransom in Bitcoin in return for hoax encryption services. It goes without saying that this is used as a scare technique at the moment. It is still extremely important to delete Wana Decrypt0r Trojan-Syria Editi0n Ransomware if it is ever found up and running on your operating system as it could start fully functioning any time and that could have disastrous outcomes. To get rid of it in the quickest way possible, make sure to follow the instructions that we provide below. Every Internet user must take certain precautionary measures to maintain a fully secure operating system at all times, especially knowing that there are tons of virtual threats online. Thus, the first steps that you need to take to improve your overall virtual security is practicing safe browsing habits. There is a vast amount of dubious sites that offer all sorts of programs for download, and they might even seem trustworthy. Unfortunately, the reality is quite different as unauthorized software distribution web pages are the primary source of installers filled with questionable applications. You can significantly reduce the risk of obtaining a potentially harmful setup file by downloading all of your software from its official developers' websites only. You must also be aware of the fact that spam e-mail campaigns are extremely prevalent among malware developers as a way to spread their intrusive programs. Thus, staying away from all e-mail attachments that come your way from unknown third-parties is paramount. Even though all of this will improve your virtual security a great deal, our research team highly advises you to invest in a licensed antimalware tool since it provides overall system security at all times. Therefore, by practicing safe browsing habits alongside a reliable antimalware tool, you will have a virtually unbreakable operating system. Do not waste any time and conduct a complete removal of Wana Decrypt0r Trojan-Syria Editi0n Ransomware at the very same time that it is found up and running on your personal computer. Be sure to follow each step of a removal procedure with care since a single mistake could lead to an incomplete removal, which could have devastating outcomes. For example, traces of Wana Decrypt0r Trojan-Syria Editi0n Ransomware could be used to restore it without your knowledge. In other situations, those same traces might be enough for this malware to continue its malicious functionality. To be sure that the termination of Wana Decrypt0r Trojan-Syria Editi0n Ransomware has been successful we advise you to double check your computer for anything associated with it once you are done with the manual removal. Select a malicious process and click End Process. The name of this process is random. Select a malicious .exe file and tap Delete on your keyboard. The name of this files is random. Select a malicious .exe file and tap Delete on your keyboard. The name of this file is random. Quick & tested solution for Wana Decrypt0r Trojan-Syria Editi0n Ransomware removal.